FRRf was created and enacted on 12th December 2013 by way of a common Law Fidelity Ceremony of a Pure Trust contract. To clarify our slogan: “working with and not against” simply explains that the FRRf works with all good sovereign governments and peoples worldwide peacefully. We take the position in working with everyone for progress and are not trying to find a culprit for any unconscionable matters. We put our attention upon the positive aspects instead of the negatives. Sanctioned by the International Court of Justice (ICJ) and the International Criminal Court (ICC), July 2017, the main objective of the FRRf is to provide an international platform for all good governments, organisations and people to file and record good title to their corpus (natural body), property, and to private conveyances. This is known as Allodial title. Our Allodial titles are governed, as all contracts are, by the Uniform Commercial code (UCc). The UCc is the present international law since the 1930 Geneva Convention. At that time, the international community was bankrupted as of the specie plunder issue. All laws outside, and below, the UCc have been suspended since that time. Thus, the articles of the FRRf Trust are recognized by the United Nations with NATO their military force cited in Chapter 3, §32 of the Charter of the United Nations 1945 (suspended Pl [Points of law]). Under UCc 1 bankruptcy Articles, any bankrupted entity (entire et al international community and its chattels, i.e., governments, banks, businesses, non-sovereigns, etc.) has no authority unto operate and/or act against an ordained and/or certified sovereign. Hence, the sovereigns controlling the present Allodial titles are viable enacted document certified sovereigns having UCc wielding power under the First Republic Registrar foundation trust provisions. Under natural law, all human individuals are ordained sovereigns by virtue of their birthright to life, liberty and happiness. The concept of sovereignty is very ancient although in the beginning of its conceptualisation the word sovereign was not necessarily employed. Rather, the phrase ‘soul reigning in the body’ was used by those sentient beings who understood who they were spiritually. Such beings are usually referred to as the elite, although the term ‘elite’ has been tainted with very negative connotations in the past hundred years or so. Thus, the elite, i.e., the top 12 richest families in banking, in government and in all social and non-social circles, know exactly what is going on in the world and about the truth of the natural birthright of every man and woman. They understand that every man and woman are ordained sovereigns at birth, and that sovereignty must be contractually-enacted by way of a Sovereignty Certificate. In other words, sovereignty certification is necessary since men and women of today are interacting with a contracts-law society. In this very basic context of nobility, sovereignty is the quality of having an independent authority over land (property) such as one’s own body (corpus). A Sovereign Underwriter in general, and under the common Law Principia (cLP), is any Exchangor/Grantor of an enacted Pure Trust foundation (PTf) and is also holder of the annexed Pure Trust certificate (PTc), along with the Pure Trust provisions (PTp). Whereas, the Certified Sovereign Underwriter of the ICJ/ICC is one who has been contractually-authorized as being qualified by natural process to issue Sovereignty Certificates. Thus, the first Official Certified Sovereign Underwriter of the ICJ/ICC is the Exchangor/Grantor and PTc holder of First Republic Registrar foundation (FRRf). 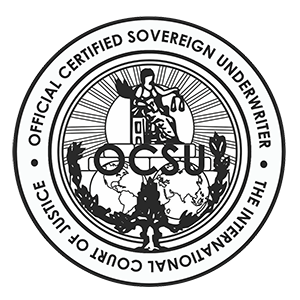 As an Official of the ICJ/ICC our Certified Sovereign Underwriter(s) may also serve the capacity as Notary Public. All documentation that bears any official stamps and seals by the Notary is accepted by all jurisdictions around the world as authenticated. 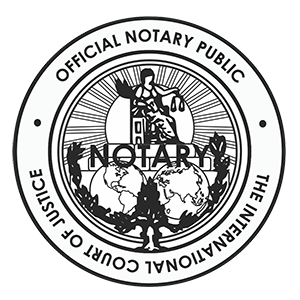 The Notary’s main function is to bear witness to the signatories of contracts, treaties, agreements and the likes. Once such documents are witnessed by the Notary’s signature, official ICJ stamp and seal, they are deemed authenticated by the highest authority in the world today and for centuries to come. After consensus voting a Notary of the ICJ/ICC can be appointed, by contract, evidenced by a Memorandum of Agreement with two Senior Judges of the ICJ/ICC along with two high-standing witnesses. Thus, there are five signatures on the MoA. An ICJ/ICC Notary Public may also serve the capacity as Assistant Judge if his/her services are required consistently over long durations of time, in particularly when dealing with specific matters of banking and redemption.